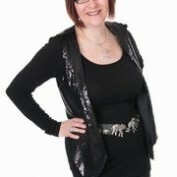 I'm a writer, NLP Master Practitioner, Life Coach, Psychic Medium and Inspirational Speaker. I work with people to help them to manage change in their lives, whether that's physical change such as a new job or home, emotional change such as a new relationship, or an attitude change I can help you. I have written for many mainstream and on line magazines, I also co-host a radio show called "The Do Something! Show" with my friend and partner-in-chocolate Nicky Marshall. This is part of "The Do Something! Tour" which is an inspirational working tour based on helping people to identify and change damaging behaviour patterns. On a personal note I live in the South West of England with one husband and 6 cats (the other way around would be against the law :-) ). I have two degrees and I'm a retired martial artist, so don't expect any punching and kicking from me unless you lay a finger on my chocolate!